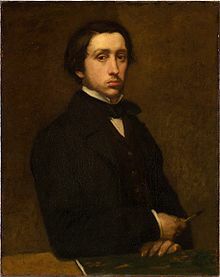 Edgar Degas (19 July 1834 – 27 September 1917), was a French painter, print-maker and sculptor. He was moreover an active organizer of several Impressionist exhibitions, but never painted 'plain air' himself. Degas, c. 1875: 'Henri Rouart  in front of his Factory', oil-painting on canvas; current location: Carnegie Museum of Art, Pittsburgh, U.S. I am busy on a portrait of my self and my aunt and my two cousins, I will show it to you when you get back. I am doing it as if I were doing a picture. I've got to do it well, because I want to leave it as a momento.. .The older one is really a lovely thing, the younger one has the devil in her as well as the kindness of an angel. I am doing them with their black dresses and little white pinafores which suit them delightfully. I have ideas for the picture's background running through my head. I would like a certain gracefulness with a nobleness of feeling that I don't know how to describe. J'ai vraiment, un vrai bagage dans la tête. S'il y avait pour cela, comme il y a partout ici, des compagnies d'assurance, voilà un ballot je ferais assurer de suite. I really have some luggage in my head. If only there were insurance companies for that as there are for so many things here, there's a bale I should insure at once. I put it [a still life of a pear, made by Manet there [on the wall, next to Ingres' painting 'Jupiter'], for a pear like that would overthrow any god. He [ Corot ] is always the strongest, he has foreseen everything. Degas made this remark about Corot to Pissarro at the preview exhibition of the 'Jules Paton sale' in Paris, 24 April 1883 and overheard by Corot's biographer Alfred Robaut . It is all well and good to copy what one sees, but it is much better to draw only what remains in one's memory. This is a transformation in which imagination and memory collaborate. Quote of Degas, as cited by Walter Sickert, in 'Post-Impressionism and Cubism', Pall Mall Gazette (1914-03-11). Apart from my heart, I feel everything grows old in me. Even my heart has something artificial. It has been sewn by the dancers in a soft, pink satin purse like their shoes. You need the natural life; I, the artificial. What a pity we allowed ourselves to be called Impressionists. Certainly, Vollard, but listen: will you have a special dish without butter prepared for me? Mind you, no flowers on the table, and you must have dinner at half past seven sharp. I know you won't have your cat around and please don't allow anybody to bring a dog. And if there are to be any women I hope they won't come reeking of perfume. How horrible all those odors are when there are so many things that really smell good, like toast - or even manure! Ah - (a short hesitation), and very few lights. My eyes, you know, my poor eyes! Vollard, please do not say anything against fashions. Have you ever asked yourself what would happen if there were no fashions? How would women spent their time? What would they have to talk about? Life would become unbearable for us men. Why, if women were to break away from the rules of fashion - fortunately there is no danger - the government would have to step in and take a hand. Vollard, Degas and others were talking about the revolution of 1847. Somebody remarked to Degas that he must have been quite young at that time. Than Degas start to quote his father. I have been singularly hard with myself. I have had to be. You must realize that this is so, since you have, at times, reproached me for it, and were astonished because I had so little confidence in myself. I have been, or seemed, hard with everyone because I was carried away by a sort of brutality born of my distrust in myself and my ill-humor. I have felt so badly equipped, so soft, in spite of the fact that my attitude towards art seemed to me so just. I was disgusted with everyone, and especially myself. I ask your pardon, then, if, with this damned art as an excuse, I have wounded your noble and intelligent spirit; perhaps even your heart.. Visitor: Monsieur Degas, were there any of Monet's pictures at the Durand-Ruel exhibition? Degas: Why, I met Monet himself there, and I said to him, 'Let me get out of here. Those reflections in the water hurt my eyes!' His pictures were always too draughty for me. If it had been any worse I should have had to turn up my coat collar. Another Visitor: How did you manage, Monsieur Degas, when you painted that plein air called 'Le Plage', the one Monsieur Rouart has? Degas: It was quite simple. I spread my flannel vest on the floor of the studio, and had the model sit on it. You see, the air you breathe in a picture is not necessarily the same as the air out of doors. She [ Mary Cassatt ] has infinite talent. I remember the time we started a little magazine called 'Le Jour et La Nuit' together. I was very much interested in processes then, and had made countless experiments [in printing; Degas mainly monotype - Cassatt mainly etchings].. ..You can get extraordinary results with copper; but the trouble is that there are never enough buyers to encourage you to go on with it. Degas's remark, when he visited one day the art-shop of Vollard and looked at a print of Mary Cassatt. If I were the government I would have a special brigade of gendarmes to keep an eye on artists who paint landscapes from nature. Oh, I don't mean to kill anyone; just a little dose of bird-shot now and then as a warning. I, marry? Oh, I could never bring myself to do it. I would have been in mortal misery all my life for fear my wife might say, "That's a pretty little thing," after I had finished a picture. I'm glad to say I haven't found my style yet. I'd be bored to death. Drawing is not the same as form; it is a way of seeing form. A man is an artist only at certain moments, by an effort of will. Objects have the same appearance for everybody. The study of nature is of no significance, for painting is a conventional art, and it is infinitely more worthwhile to learn to draw after w:Holbein. The museums are here to teach the history of art and something more as well, for, if they stimulate in the weak a desire to imitate, they furnish the strong with the means of their emancipation. A picture is a thing which requires as much knavery, as much malice, and as much vice as the perpetration of a crime. Make it untrue and add an accent of truth. Even working from nature you have to compose. Drawing is not what you see but what you must make others see. Make a drawing. Start it all over again, trace it. Start it and trace it again. You must do over the same subject ten times, a hundred times. In art nothing must appear accidental, even a movement. Work a great deal at evening effects, lamplight, candlelight, etc. The intriguing thing is not to show the source of the light but the effect of the lighting. Painting is not very difficult when you don't know how; but when you know, oh! then, it's another matter. It requires courage to make a frontal attack on nature through the broad planes and the large lines and it is cowardly to do it by the facets and details. It is a battle. Everybody has talent at twenty-five. The difficult thing is to have it at fifty. I will not admit that a woman can draw like that. Une peinture, c'est d'abord un produit de l'imagination de l'artiste, ce ne doit jamais être une copie. Si, ensuite, on peut y ajouter deux ou trois accents de nature, evidemment ca ne fait pas de mal. Oh! Women can never forgive me. They hate me, they can feel that I ‘m disarming them. I show them without their coquetry, in the states of animals cleaning themselves... ...I'm sure of it; they see me as the enemy. Fortunately, since if they did like me, that would be the end of me. ..women... ...their way of observing, combining, sensing the way they dress. They compare a thousand of more visible things with one another than a man does. Anyone would think paintings were made like speculations on the stock market, out of the frictions of ambitious young people... ...it sharpens the mind, but clouds your judgement. [make drawings of] series of instruments and players; their shapes, twisting of the hands, arms and neck of the violinist; for example, puffing out and hollowing of the cheeks of bassoonists, oboists, etc..
We were created to look at one another, weren't we. I always suspect an artist who is successful before he is dead. A strange fellow, this Degas — sickly, a bundle of nerves, with such weak eyes that he is afraid of going blind, yet for these very reasons extremely sensitive to the character of things. He is more skillful in capturing the essence of modern life than anyone I know. ..while speaking to us [Degas, to the brothers Goncourt] with their language and explaining technically the stroke of the iron for pressing and the circular stroke, etc.. .And it is really very humorous to see him [Degas], up on his toes, and with his arms curved, blending the aesthetics of the dance master with the aesthetics of the painter. The best thing he [Degas] does are his sketches. As soon as he gets to polish a picture, his drawing [in the picture] grows weak and pitiable. The drawing in pictures like his 'Portraits in an office' [in New Orleans], results in something between a marine painting and an engraving for an illustrated newspaper. A painter of modern life had been born, moreover, a painter who derived from and resembled no other, who brought with him a totally new artistic flavor, as well as totally new skills. The ones [compliments] I value most came from Edgar Degas who said he was happy to see my work becoming more and more pure. You [Lucien Pissarro] will also be very pleased to find in reading the book [L'Art Moderne of Huysmans ] that you are not alone in your enthusiasm for Edgar Degas, who is without a doubt the greatest artist of the period. Degas is a hundred times more loyal [than other impressionist artists, then]. - I told Degas that Seurat's painting was very interesting. [Degas:] 'I would have noted that myself, Pissarro, except that the painting is so big!' Very well - if Degas sees nothing in it so much the worse for him. This simply means there is something precious that escapes him. We shall see. 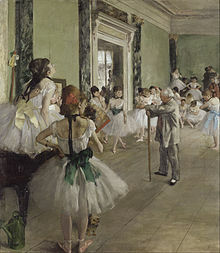 I used to go and flatten my nose against that window and absorb all I could of his [Degas'] art. It changed my life. I saw art then as I wanted to see it. With what is he [Degas] concerned? Drawing was at its lowest ebb; it had to be restored. Looking at these nudes, I exclaim, "Drawing has come back again!" As a man and painter he sets an example. 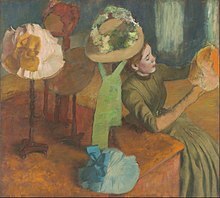 Degas is one of those rare masters who could have had anything he wanted, yet he scorned decorations, honors, fortune, without bitterness, without jealousy. It isn't ideas I'm short of.. .I've got too many [on discussing poetry with Mallarmé, who replied]: Degas, you can't make a poem with ideas - you make it with words'. I have often heard Degas say that in painting you must give the idea of the true by means of the false. because of the many tracings that Degas did of his drawings, the public accused him of repeating himself. But his passion for perfection was responsible for this continual research. I would ask him to give me his definition of drawing. 'You don't know a thing about it,' he would always end up saying. And without fail he would go on to this apologue: that the Muses do their work on their own, each apart from the others, and that they never talk shop. The day's work over, there are no discussions, no comparisons of their respective labors. 'They just dance,' he [Degas] would shout. Forain s'était construit un hôtel, et fil installer le téléphone presque nouveau. Il voulut d'abord "épater" Degas. Il l'invite à dîner, previent un compere, qui, pendant le dîner, appelle Forain à l'appareil. Quelque mots échangé, Forain revient. Degas lui dit: "C'est ça le téléphone? On vous sonne et vous y allez." When Forain built himself a town house, he installed a telephone, which was still not in very wide use. Wanting above all to surprise Degas with it, he invited him to dinner, and forewarned a friend, who summoned Forain to the receiver during the meal. After exchanging a few words, Forain sits down at table again. "So that's the telephone?" says Degas. "They ring, and you run." Quote by Paul Valéry, in Degas Danse Dessin (1935): "More Obiter Dicta"
Indeed, Degas, immured in his Paris studio, was so little of this world that he became almost a legend. He was pictured as a sort of monster whose misanthropic furies against those who tried to force his friendship were unbounded. In the latter years of his life, there was a story current that an old friend, having obtained permission from Degas to visit his studio, was met by a bearded demon at the door and thrown bodily down the stairs. [Degas compared] to a writer striving to attain the utmost precision of form, drafting and redrafting, canceling, advancing by endless recapitulation, never admitting that his work has reached its final stage: from sheet to sheet, copy to copy, he continually revises his drawing, deepening, tightening, closing it up. I am convinced that Degas felt a work could never be called finished, and that he could not conceive how an artist could look at one of his pictures after a time and not feel the need to retouch it. Severely self-critical, he would take a certain pleasure in repeating what a critic had said about him in a review of an exhibition: Continually uncertain about proportions. 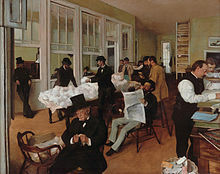 Nothing, he [Degas] claimed, could better describe his state of mind while he was toiling and struggling over a work. Whenever Degas came upon some more or less early work of his own, he always wanted to get it back on the easel and rework it. Thus, after seeing again and again at our house [of the art-buyer w:Henri Rouart ] a delightful pastel my father had bought and was very fond of, Degas.. ..would not let the matter alone, and in the end my father, from sheer weariness, let him take it away. It was never seen again.. ..in the end he had to confess his crime: the work entrusted to him for a few retouches had been completely destroyed.. ..It was then that Degas, to make it up to him for his loss, sent him one day the famous 'Danseuses a la barre'..
All Paris knew him as a fighter, a recluse, guarding his privacy with cruel, crushing words. The habitués of the Paris boulevards defended themselves against his scorn by accusing him of insincerity. "Degas," they said, "would like to see his reflection in a boulevard window in order to give himself the satisfaction of breaking the plate-glass with his cane."